If you want your internet connection to perform at its absolute best it is critical to make sure the DNS servers you are using are as fast as possible. Before your browser can even begin to load a web page it needs to resolve the domain name to an IP address. If your ISP’s DNS servers are overloaded or not geographically near you then your web browsing may not be as fast as it could be. 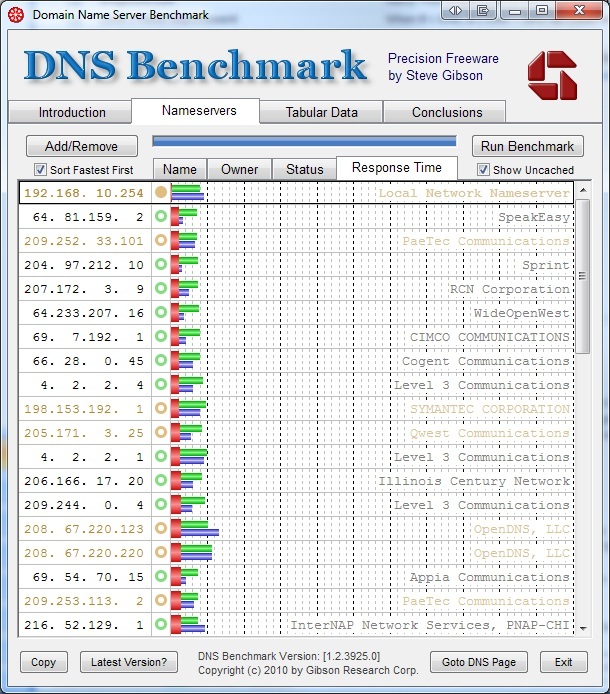 Steve Gibson has created a great tool to automatically benchmark your current DNS servers against thousands of public DNS servers available on the internet. 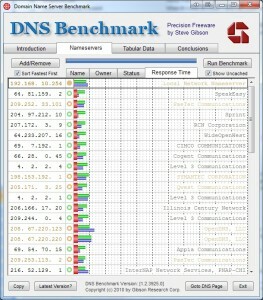 You can download DNS Benchmark here. DNS Benchmark doesn’t require any installation, simply download then run the executable. Once the program finishes initializing you can begin the benchmark by clicking on the ‘Nameservers’ tab then clicking ‘Run Benchmark’. After the program completes the tests (which normally takes a few minutes) you can see where your local network DNS servers rank against all of the ones tested. Clicking on the ‘Conclusions’ tab will also provide a useful general analysis of what the tests found. You will also be prompted by the program to create a ‘Custom List’. Creating the custom list will test nearly 5,000 dns servers to find the top 50 DNS servers based on your location, ISP , etc, for future tests. I highly recommend creating the custom list. The process takes about 35 minutes to complete but it will increase the accuracy of your benchmarks. If you’ve found that the DNS servers you are using rank poorly compared to others you should consider replacing them. If you’re using a router on your network most have an option to override the DNS servers provided by your ISP and specify your own manual or static dns servers. If you don’t have a router or only want to change the DNS servers for once PC you can set static DNS servers in the properties of your network connection. Personally I’ve had great luck using OpenDNS servers, I have found them to be fast and reliable. OpenDNS also offers some great features if register for a free account and add your IP address. How did your DNS servers rank up? Share your results by commenting below. Interested in other ways to improve your internet connection? Check out my previous post about setting up a pfsense router.